Home Birthday Need Crafting time?? Marilyn SanClemente January 9, 2018 January 9, 2018 Birthday, Occasions catalog, Stampin' Up! I am so excited!! Our 3rd Full Day of Crafting Fun is coming up! January 27th from 9am to 7pm. That is 10 hours of Crafting fun! You can print the Flyer HERE to share with your friends. Early Bird Registration Closes on Sunday the 14th. So Hurry up and register to save your spot at just $75 for the day! You can register HERE. Each Attendee will have 6′ of dedicated table space to work on your projects. Breakfast and Lunch and are provided with lots of snacks throughout the day! We will also be offering cheese and crackers with a dessert in the late afternoon. We will have raffles available. The Grand Prize is a FULL set of the new Stampin’ Up! Blends Markers! And of course there will be games throughout the day. We have designed 4 FANTASTIC classes for the day! I am so glad that I don’t need to choose which class to go to! You can see the details and register for the classes HERE. 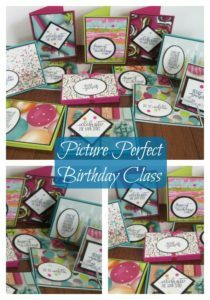 The First class is the Picture Perfect Card Class with Jeannie. In this class you will make 10 cards with a gift box and gift card. 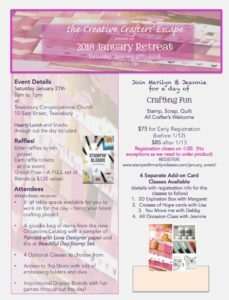 You will also receive a half a package of the Picture Perfect Designer Series Paper so you will have plenty of paper left to make more cards after the class! 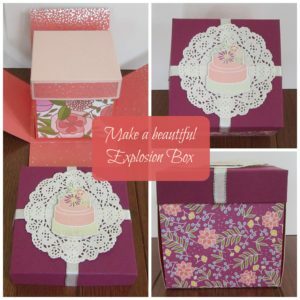 in the Second Class you will make an Explosion Box with Margaret. You will learn this beautiful technique for making these exquisite boxes filled with a surprise. Sure to Wow your Family or Friend! The Third Class is Movers & Shakers with Debby. 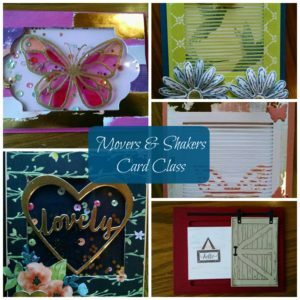 In this class you will learn how to make a shaker card and 2 different types of cards that Move! 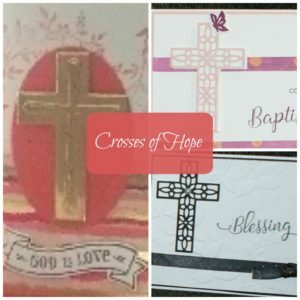 The Fourth Class is Crosses of Hope with Lisa. I have to say that this is one of my favorite new stamp sets in the Occasions catalog! You will make 4 gorgeous cards with this new set and framelits… Perfect for Baptism, Confirmation or Sympathy cards! You can Register for the Day HERE. You can Register for one or more CLASSES HERE. I hope to see you on the 27th! Happy New Year! Occasions Catalog and Sale-a-bration are HERE! !